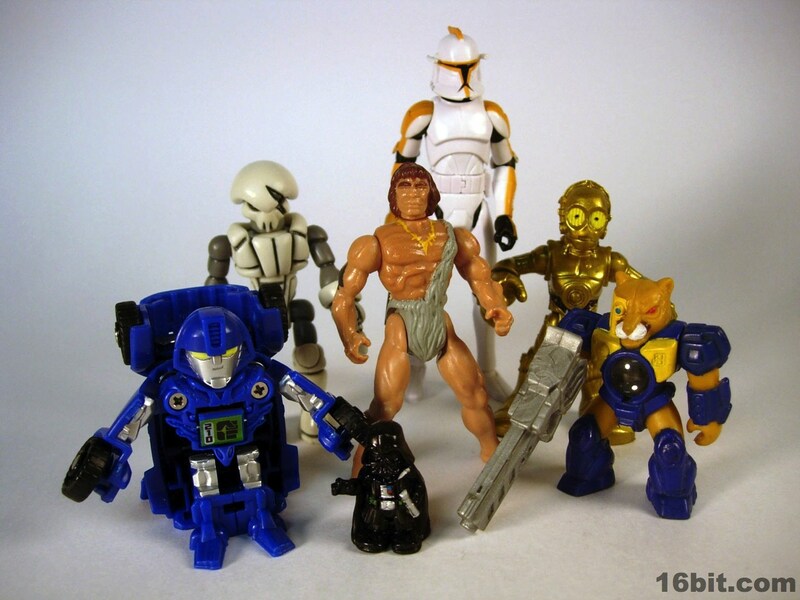 By the end of the 1980s, most new toy concepts were built around smaller figures with larger vehicles and playsets. This gave us the likes of Dino-Riders, Bone Age, M.A.S.K., Starcom, and a number of other tip-top toys which basically ruined us for the current generation of really big figures which don't do anything. 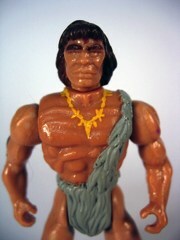 Granted, it's not like Crag the Clubber is remembered as some sort of triumph of toymaking. 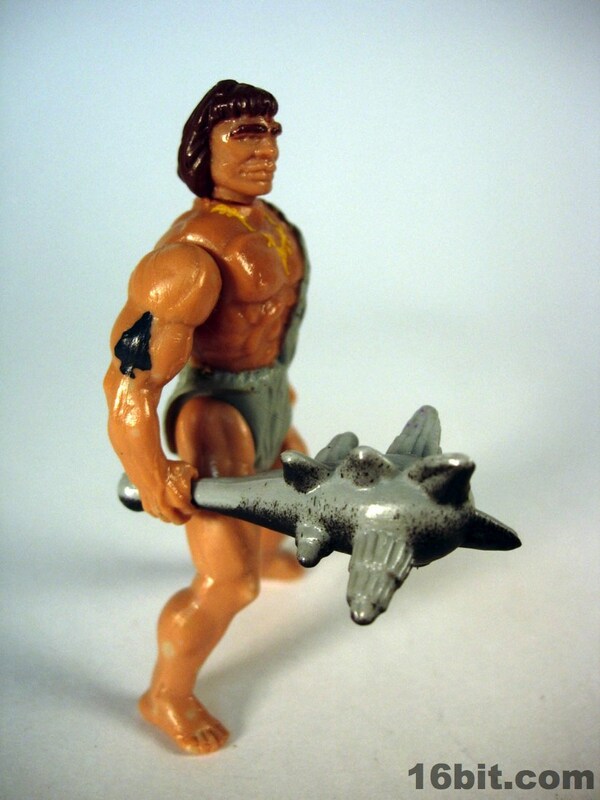 More than likely, you don't know what it is, and my guess is that Bone Age is what you probably think Pauly Shore used as a synonym for getting it on, but let's look at this caveman. Like most of the older toys on this site, this is another figure I've been hauling around since I was a wee lad. I remember where most of my toys came from, but not my Bone Age stuff-- I'm assuming it was a birthday present or something. Billed as a "complete action system," the line gave you a big pile of bones which could be built into a dinosaur skeleton or a number of other configurations, making it similar to Construx or any of the many other things-that-weren't-LEGO from its day. The dinosaurs were just under $10 to start with, but for the "entry-level price point" you could buy a small 3-inch action figure with some swell weapons. 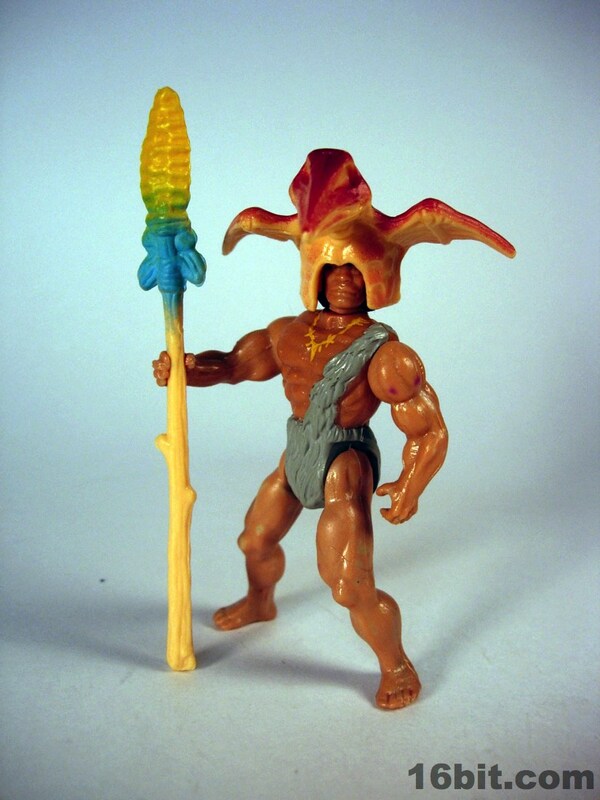 The dinosaurs came with cavemen figures, but not spears or clubs, so figures like Crag made up for it by including three weapons and an awesome hat. 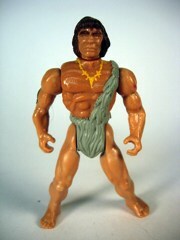 The sculpt is about as good as you should expect from a tiny Kenner caveman from 1988. Five points of articulation, a torso and arms shared with Zur and legs shared with other figures, and muscles galore. The head has painted eyebrows and hair, with the eyes left untouched. Rather than sculpt on unique features, he has a yellow necklace painted on his chest and a stone arrowhead on his arm, which I believe I assumed was a Christmas tree until the late 1990s. He has no problem sitting and his joints move freely, although he may require a little extra support due to his smaller feet. 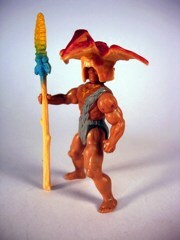 I suggest propping him up with his spear. 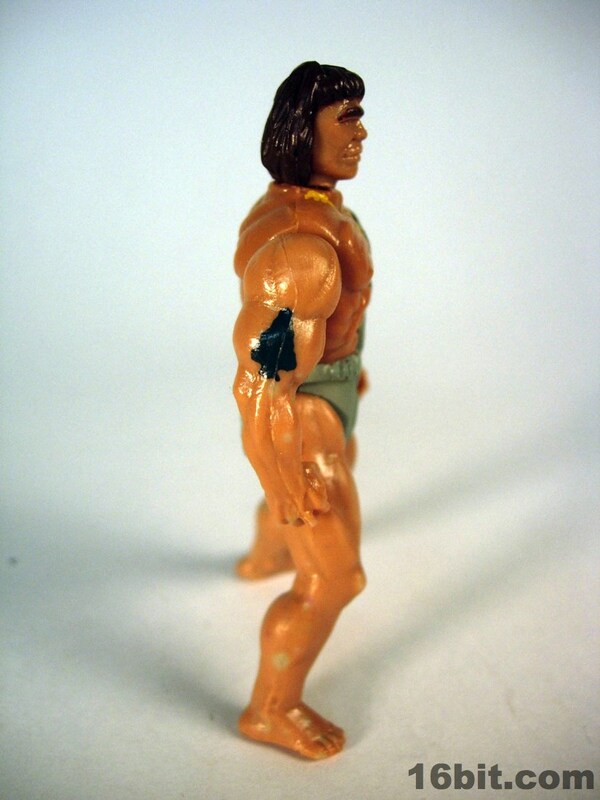 His accessories are notable because unlike many Kenner weapons of the 1980s, they got some paint. The club is molded in grey, and sports black markings. 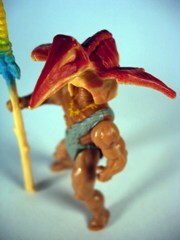 The jawbone is left a sensible off-white bone color, but the spear has a yellow tip and blue feathers. The chief hat-- I'm assuming, there's no other explanation as to what this could be-- has red painted on top, and looks like a small mummified dinosaur. Because toy companies actually tested to make sure figures could hold their weapons in 1988, there are no problems with the figure interacting with his gear. 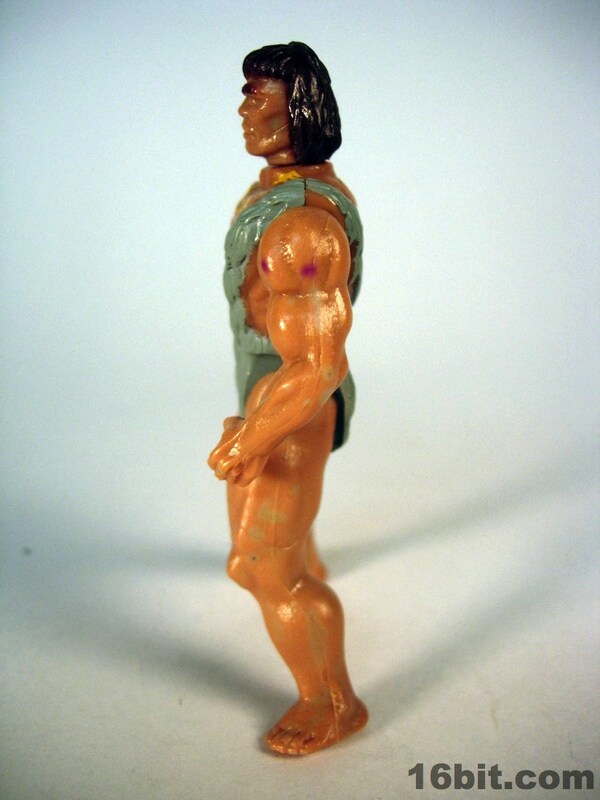 Today, this figure is still pretty cheap-- ten bucks or less should get you a carded sample. 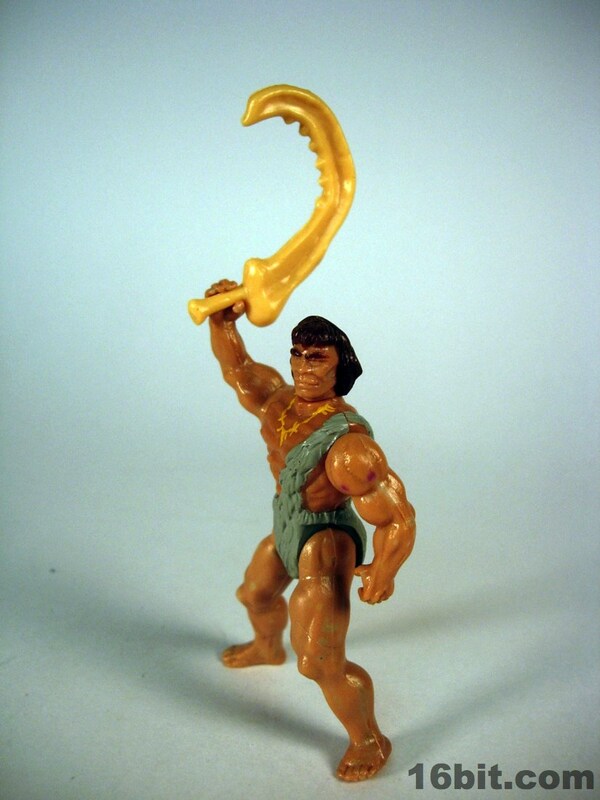 I won't say it's worth the asking price, because even when I was a kid I knew this was a pretty iffy toy. But I'll go a long way for a stupid hat, and the pterosaur bonnet is too darned goofy to ignore. If I stumbled on a case of Bone Age cavemen figures at the Big Lots! for a buck a piece, I can't say I'd be tempted to buy too many more on the merits of the aesthetics alone, or on the amount of fun I had with them as a kid. But they do have some really goofy accessories, and that counts for a lot in my book. 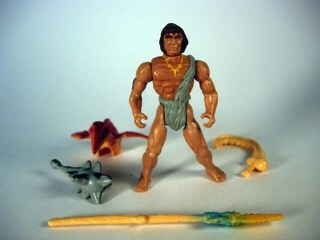 As another footnote in the era where action figures were below 3-inches tall, but not yet "micro," it's a unique evolutionary step in toy development. He is basically a standard Kenner 5-joint figure, just smaller. 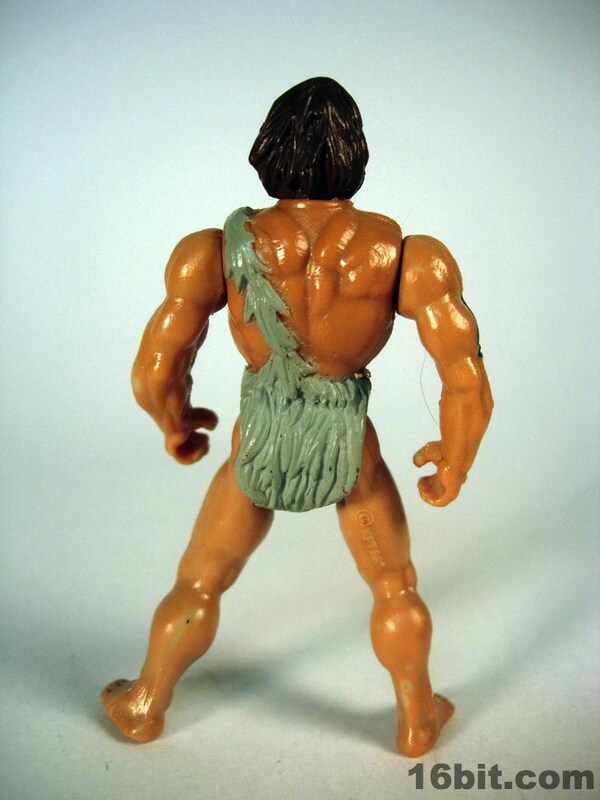 Kenner was pretty smart to build more interesting toys with a smaller human figure as a companion, as were the other toy companies, but it seems this kind of smaller articulated has all but fallen out of favor, at least in the non-toddler or non-collector segments.